Stay on top of the latest kitchenware trends | Atelier du Chef - Thinking of Purchasing a Dishwasher? Thinking of Purchasing a Dishwasher? As you know, clean dishes and glassware are an important part of a restaurant’s good reputation. Commercial dishwashers are amongst the most expensive pieces of equipment in a commercial kitchen, and one of the most important! Choosing a commercial dishwasher is serious business! So, how can you be sure to choose the right dishwasher? We have prepared this article to help you make an informed decision. These are an excellent choice if you operate a coffee shop, a bar, a small restaurant, a childcare facility, or any establishment that serves fewer than 100 meals per hour. It is as compact as a domestic dishwasher, but can handle up to 35 loads of dishes per hour. These pedestal dishwashers have one or two side doors that allow easy loading and unloading. They range in heights of more or less 60 inches, and can accommodate up to 6 baking sheets when extended. A conveyor belt transports dish racks to be cleaned, rinsed, and disinfected. These dishwashers come with high temperature or cold temperatures options with chemical disinfectants. 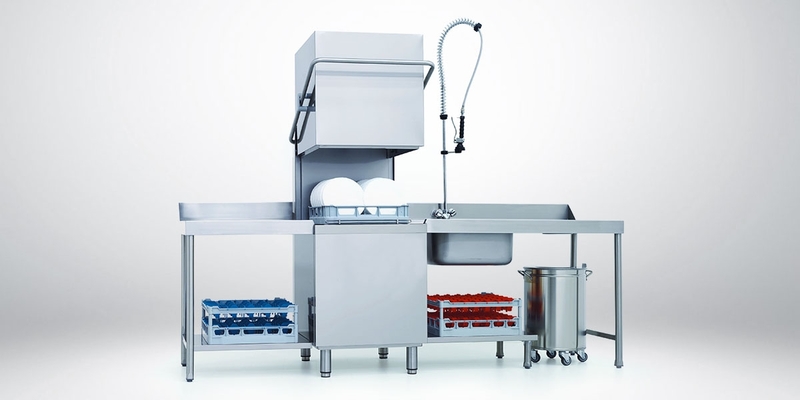 They can handle up to 200 loads of dishes per hour, and are available in 44, 66, or 86 in. formats. As its name implies, this dishwasher can be configured according to your specific needs. It is especially suitable for cafeterias, hospitals, and banquet halls. Did you know you will do approximately 35 loads of dishes for every 100 meals served? Of course, this number can vary depending on the type of establishment you operate. High-end restaurants, for example, serve fewer meals than fast-food restaurants. Your dishwasher must be able to withstand busy periods. Plan ahead by purchasing a dishwasher that has an additional capacity of 10% to 20% than your current needs. Commercial dishwashers have a lifespan of 5 to 10 years. Remember to consider the type of dishes, cookware, and utensils your establishment uses when calculating the capacity and type of dishwasher you need. Once again, choosing the right equipment for your establishment is very important. Feel free to contact us if you need help finding the perfect dishwasher for your commercial kitchen. Our team has the knowledge, and most of all, the expertise to help you make an informed decision according to your budget and needs. Give us a call, we will be happy to answer any questions you may have.